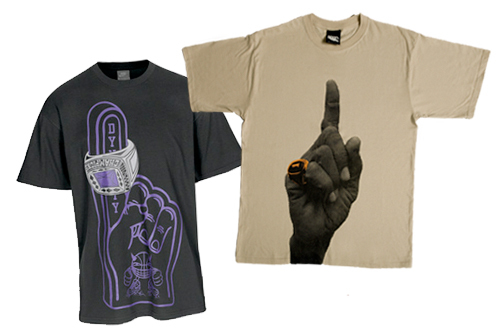 Call me paranoid, but browsing my favourite German online shop for cool apparel, Frontline, I came across NikeÂ´s new ring finger tee which I couldnÂ´t help reminding me of one of our very own shirts :-). Compare yourself in the picture above. And if youÂ´re quick, you can get hold of the very final medium sized “One” shirt in our store. In other world brand news, Ecko Unlimited seems to be running perimeter advertising in English football arenas. At least I saw some watching Manchester CityÂ´s UEFA cup match tonight. Not too innovative but still impressive. I will talk about my hustle in the music business and in the tech industry. My goal is to enrich myself through the pursuit of my goals and encourage others to do the same. Probably nice to read, too: “Streetwear History” (via Artschoolvets) and “A Powerful Guide to Your Own Clothing Line” (via A Better Tomorrow).